Whenever you score an agenda, you may place 1 agenda counter on it. Titan Transnational is shaping up to be a high-tier ID, specially combined with the upcoming asset "Mark Yale". Project Atlas: Atlas becomes incredibly good in this ID, to the point where it enables an entire Fast Advance strategy by allowing you to chain Atlas on top of a SanSan City Grid (Atlatrain anyone?). Even if Fast Advance isn't your cup of tea, getting that extra point on Atlas every score will make your strategy much more consistent. Geothermal Fracking: Geo Fracking becomes much beefier with a third additional use. If you aren't scared of taking bad pub, you'll be making stupid amounts of money. High-Risk investment: Perhaps the most powerful interaction of the bunch, a scored HRI in Titan tells the runner "never go over 5 credits". Firmware Updates: An extra use out of Firmware Updates might not seem like much, but it might make a difference. It's definitely something you will want in your deck to exploit with Mark Yale! It's important to note that even agendas that don't involve agenda counters at all, also get an agenda counter. This wouldn't mean anything if it wasn't because of Titan Transnational's de-facto director, Mark Yale (I'm not sure yet if there's a lore connection, but the mechanics are so connected that I'm almost sure). With him in the deck, every agenda score means an extra 3 credits, and multi-counter agendas like Firmware Updates will quickly drown you in piles of cash. This, in my opinion, is the strongest Weyland ID, sharing the top spot with Blue Sun, but ultimately ahead thanks to the incredible interaction with Mark Yale. It's a good day for Weyland! One more agenda you can use with Titan is Executive Retreat. Doesn't hurt to have an extra Draw 5 Cards ability. Wouldn't be in my suite personally, but if you wanted to have minimal agenda density it could be good. Am I interpreting this ability correctly? This would make Project Beale a 3/3 and Market Research a 3/4 for Corp and only worth 2 for the Runner. 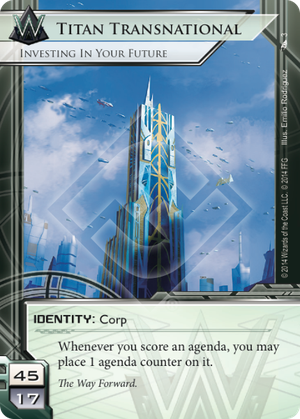 That seems valuable, but I have not seen these agendas in Titan decks so thinking I'm wrong... or that the other counter agendas add more value than the extra agenda points.